The rough sea, strong winds and torrential rain on our trip to Gozo showed us the small island was taking a stormy break from its habitual dry weather and sunshine. The turbulent weather of end of 2016 was soon forgotten when we saw how pleased Susan was upon receiving her copy of Islands of Cats. Her smile and warm appreciation brightened the room as she looked at the pages. Two cats, Poppy and Pushy, entered the front door (which is always open for strays), and immediately jumped on the table as if to see if their picture was also in the book. 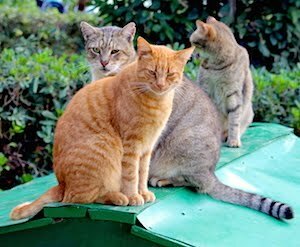 You can read more about Susan and her years of caring for stray cats in 'Islands of Cats' on pages 97-99. The book tells the story of a representative 22 of over 1,000 stray cat carers in Malta and Gozo on 128 pages, illustrated by over 250 colourful photographs - accompanied by cat facts, stories, interviews, and it introduces places of interest on the Islands. 'Islands of Cats' is available in English, Maltese and German, as well as E-Books including Kindle. And most of all, we donate part of the proceeds of each book sold in aid of neutering and spaying of stray and abandoned cats in the Maltese Islands. Click here to order your copy, and please tell your friends.